The United States began drastically reducing their troop support in South Vietnam during the final years of Vietnamization. Many U.S. troops were removed from the region, and on March 5th, 1971, the United States returned the 5th Special Forces Group, which was the first American unit deployed to South Vietnam, to its former base in Fort Bragg, North Carolina. Under the Paris Peace Accords, between North Vietnamese Foreign Minister Le Duc Thọ and U.S. Secretary of State Henry Kissinger, and reluctantly signed by South Vietnamese president Thieu, U.S. military forces withdrew from South Vietnam and prisoners were exchanged. North Vietnam was allowed to continue supplying communist troops in the South, but only to the extent of replacing expended materiel. Later that year the Nobel Peace Prize was awarded to Kissinger and Thọ, but the Vietnamese negotiator declined it saying that a true peace did not yet exist. The communist leaders had expected that the ceasefire terms would favor their side. But Saigon, bolstered by a surge of U.S. aid received just before the ceasefire went into effect, began to roll back the Viet Cong. The communists responded with a new strategy hammered out in a series of meetings in Hanoi in March 1973, according to the memoirs of Tran Van Tra. As the Viet Cong's top commander, Tra participated in several of these meetings. With U.S. bombings suspended, work on the Ho Chi Minh trail and other logistical structures could proceed unimpeded. Logistics would be upgraded until the North was in a position to launch a massive invasion of the South, projected for the 1975-76 dry season. Tra calculated that this date would be Hanoi's last opportunity to strike before Saigon's army could be fully trained. Calling for immediate withdrawal of U.S. forces from Vietnam, George McGovern's 1972 Presidential Campaign lost 49 of 50 states to Richard Nixon. In the November 1972 Election, Democratic nominee George McGovern lost 49 of 50 states to the incumbent President Richard Nixon. On March 15th, 1973, President Nixon implied that the United States would intervene militarily if the communist side violated the ceasefire. Public and congressional reaction to Nixon's trial balloon was unfavorable and in April Nixon appointed Graham Martin as U.S. ambassador to Vietnam. Martin was a second stringer compared to previous U.S. ambassadors and his appointment was an early signal that Washington had given up on Vietnam. During his confirmation hearings in June 1973, Secretary of Defense James R. Schlesinger stated that he would recommend resumption of U.S. bombing in North Vietnam if North Vietnam launched a major offensive against South Vietnam. On June 4th, 1973, the U.S. Senate passed the Case-Church Amendment to prohibit such intervention. The oil price shock of October 1973 following the Yom Kippur War in Egypt caused significant damage to the South Vietnamese economy. 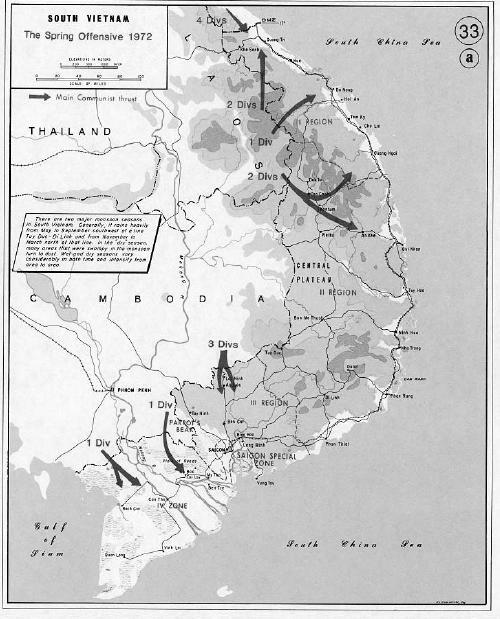 The Viet Cong resumed offensive operations when the dry season began and by January 1974 it had recaptured the territory it lost during the previous dry season. After two clashes that left 55 South Vietnamese soldiers dead, President Thieu announced on January 4th that the war had restarted and that the Paris Peace Accord was no longer in effect. There had been over 25,000 South Vietnamese casualties during the ceasefire period. Gerald Ford took over as U.S. president on August 9th, 1974, after President Nixon resigned due to the Watergate scandal. At this time, Congress cut financial aid to South Vietnam from $1 billion a year to $700 million. The U.S. midterm elections in 1974 brought in a new Congress dominated by Democrats who were even more determined to confront the president on the war. Congress immediately voted in restrictions on funding and military activities to be phased in through 1975 and to culminate in a total cutoff of funding in 1976. The success of the 1973-74 dry season offensive inspired Tra to return to Hanoi in October 1974 and plead for a larger offensive in the next dry season. This time, Tra could travel on a drivable highway with regular fueling stops, a vast change from the days when the Ho Chi Minh trail was a dangerous mountain trek. Giap, the North Vietnamese defense minister, was reluctant to approve Tra's plan. A larger offensive might provoke a U.S. reaction and interfere with the big push planned for 1976. Tra appealed over Giap's head to first secretary Le Duan, who approved of the operation. Tra's plan called for a limited offensive from Cambodia into Phuoc Long Province. The strike was designed to solve local logistical problems, gauge the reaction of South Vietnamese forces, and determine whether U.S. would return to the fray. On December 13th, 1974, North Vietnamese forces attacked Route 14 in Phuoc Long Province. Phuoc Binh, the provincial capital, fell on January 6th, 1975. Ford desperately asked Congress for funds to assist and re-supply the South before it was overrun. Congress refused. The fall of Phuoc Binh and the lack of an American response left the South Vietnamese elite demoralized. The speed of this success led the Politburo to reassess its strategy. It was decided that operations in the Central Highlands would be turned over to General Van Tien Dung and that Pleiku should be seized, if possible. Before he left for the South, Dung was addressed by Le Duan: "Never have we had military and political conditions so perfect or a strategic advantage as great as we have now." At the start of 1975, the South Vietnamese had three times as much artillery and twice the number of tanks and armored cars as the opposition. They also had 1,400 aircraft and a two-to-one numerical superiority in combat troops over their Communist enemies. However, the rising oil prices meant that much of this could not be used. They faced a well-organized, highly determined and well-funded North Vietnam. Much of the North's material and financial support came from the communist bloc. Within South Vietnam, there was increasing chaos. The departure of the American military had compromised an economy dependent on U.S. financial support and the presence of a large number of U.S. troops. South Vietnam suffered from the global recession that followed the Arab oil embargo.